Of the Vedas I am the Sama Veda; of the demigods I am Indra, the king of heaven; of the senses I am the mind; and in living beings I am the living force [consciousness]. Why Lord Krishna says He is Sama Veda among Vedas? Is Sama Veda the best among Vedas? If yes, how? Samaveda is the Veda of melodies and chants. It's verses are primarily derived from Rigveda (which is believed to be oldest/first and important veda from all). It includes many mysterious verses which indicates the knowledge of ultimate & absolute truth. (The most important & widely studied Chandogya Upanishad also comes from Samaveda.) Singing and listening these verse musically, It (comparatively) more effects the influences of devotion and spirituality. 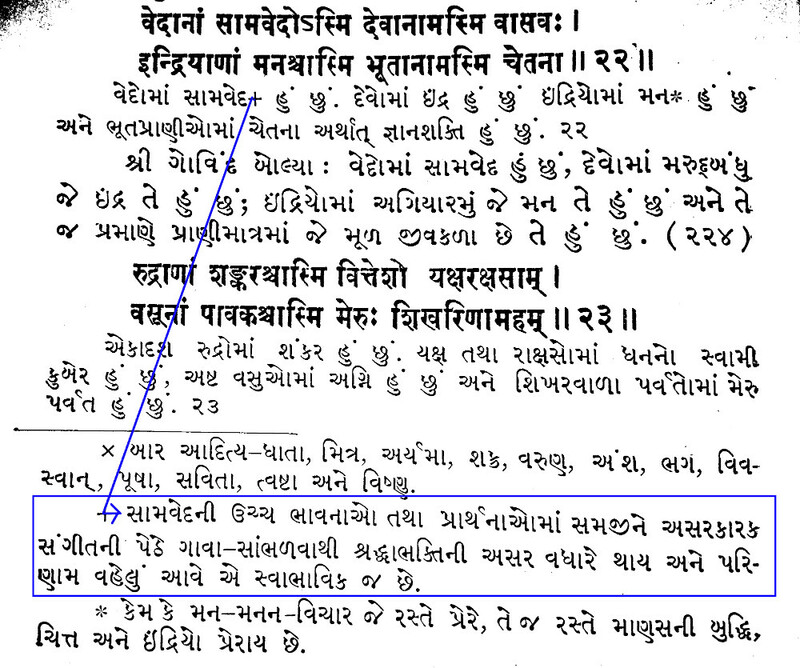 So, due to such importance/significance of Samaveda, Lord Krishna says He is Sama Veda among Vedas. Where sentence in rectangle is similar to that of emphasized text in above explanation. Full many a wise man lifts to thee the song of praise, and hails thee with a kiss as Sovran of this world. 2 Men, Vasu! by the Soma, with lauds call thee to the foremost place: When comest thou athirst unto the juice as home, O Indra, like a bellowing bull? The mantras of Sāmaveda are chanted musically so they're are especially pleasing to the Gods more than the mantras of the other Vedas which is why Krishna compares himself to the Sāmaveda. "Sāma" denotes that which brings equipoise or tranquility to the mind. There are four well-known ways of dealing with an opponent or rival: sāma, dāna, bheda and daṇḍa. The first method is that of conciliation, making an enemy a friend through affection. The Sāmaveda enables us to befriend the divine forces, even the Paramātman. How do we make a person happy? By praising him. If the panegyric is set to music and sung he would be doubly pleased. Many of the mantras of the Rigveda are intoned with a cadence in the Sāmaveda; thus we have Sāmagāna. While the rks are chanted with the tonal differences of udātta, anudātta and Svarita, the sāmans are intoned musically according to certain rules. Our music, based on the seven notes (saptasvara), has its origin in Sāmaveda. All deities are pleased with Sāmagāna. We become recipients of their grace not only through the offerings made in the sacrificial fire but through the intoning of the samans by the udgātā. Sāmagāna is particularly important to Soma sacrifices in which the essence of the soma plant is offered as oblation. Though the sāmans are indeed Rgvedic mantras, they are specially capable of pleasing the deities and creating Atmic uplift because they are intoned musically. This is what gives distinction to the Sāmaveda. Sri Krsna Paramātman says in the Gita: "Vedānām Sāmavedosmi" (Of Vedas I am the Sāmaveda). The Lord is everything, including good as well as bad. Even so, as he speaks to Arjuna about the things in which his divine quality specially shines forth, he mentions the Sāmaveda among them. In the Lalita-Sahasranana (The One Thousand Names of the Goddess Lalita), Ambā has the name of "Sāmagāna-priya (one who delights in Sāmagāna); she is not called "Rigvedapriya" or "Yajurveda-priya". Syāmasāstri refers to the goddess Minaksi as "Sāmagāna-vinodinī" in one of his compositions. In the Śiva-astottaram ["Śiva astottara-satam", the 108 names of Śiva], Śiva is worshipped thus: "Sāma priyaya namah." The Tevāram extols Śiva as one who keeps chanting the Chandoga-Sāman (Chandoga-Sāman odum vāyān). Appayya Diksita has sought to establish that Isvara or Śiva, Amba and Visnu are "Ratna-trayi" (the Three Gems) occupying the highest plane. And all three have a special relationship with the Sāmaveda. Not the answer you're looking for? Browse other questions tagged vedas krishna bhagavad-gita sama-veda . Why did Sri Krishna say he is VAJRA among weapons? Why is Indra called vAsava? Why did Sri Krishna say he is Indra among Devatas? If Brahman is everything, then why does Krishna (Brahman) describe himself as “best of things” in Bhagavadgita? Apart from living beings, does Paramatma exist in atoms of non living material world also?